Through September and October we have been gathering photos and information for this blog. Enjoy! 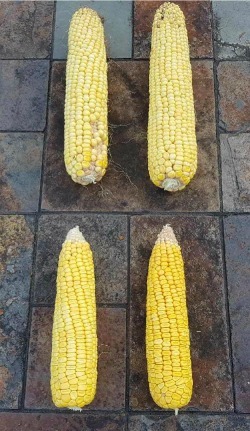 In the picture below, from mid-September, you see two corn varieties planted on the same day. On the right, that corn is more mature and will be harvested for dry corn. However, because it is a smaller cob there will be a lower yield. The one on the left will be harvested for corn silage. 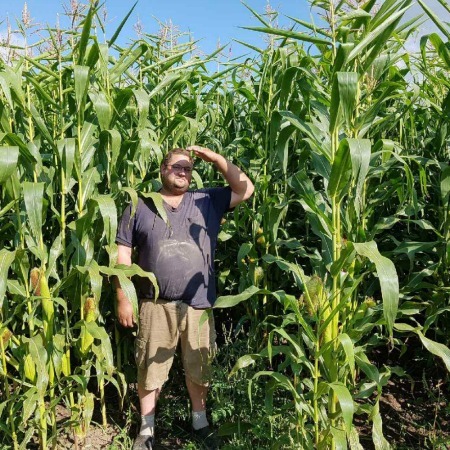 Here is Danny, our crop manager in a field of corn that will be harvested for silage. All corn is late maturing this year due to the wet spring and cool summer. We are really hoping that a killing frost is still a month away in mid to late October for all of the corn crop. The warmer weather of mid-September is helping for sure. It's amazing what 2 weeks of warm weather does. 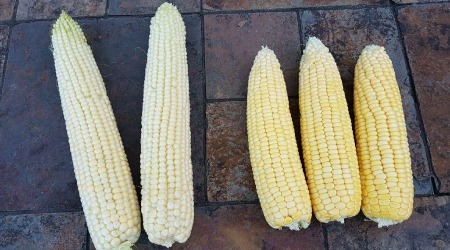 Same corn, same fields shown in the picture to the right. The one on the top is for corn silage, the one on the bottom for dry corn. As you can see, the corn silage is all yellow now . 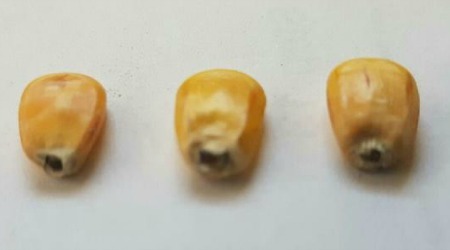 Both types of corn are starting to dry and the individual kernels are becoming dented. The denting indicates the milk liquid within the kernel has become starch. Now we wait for the black layer. This small layer of black cells will be formed between the kernel and the cob, closing movement of nutrients off. This will indicate the physiological maturity of the corn and we are estimating that will be about 3 weeks from now. Now in late October, our dry corn has now reached the black layer stage and is physically mature. Hopefully it will dry down some more before we combine it. These photos are from October 26th and 27th. An excellent crop of corn silage coming in. And now we have an empty field and full silos! As the silos are full, we then use a bag to help with storage. Here are pictures of the last crop coming in. Beautiful weather. Good yield. Moisture at 24%. Who would have expected this in August? All those sleepless nights for nothing. Welcome to the world of farming. The red bins that are seen to the side are called 'gravity bins'. The combine empties from it's bin into the gravity bins at times through the harvesting. This allows the combine to stay in the field and focus on harvesting, while the tractor and gravity bins do the corn deliveries. The corn provided starch or energy. Beans provided protein. The squash for taste, minerals and weed control. Today various types of corn are grown. This type of corn is grown for human consumption and is harvested early summer for juicy tender kernels. This is a specialty corn, as not all corn varieties will pop. It is mainly grown in the United States, although some small producers do exist here in Canada. The whole corn plant is harvested at 60% moisture and is stored in an anaerobic environment - either a vertical silo or bunk silo. Corn silage does not have to reach full maturity because it is harvested wet. This is the majority of corn grown in Ontario. The kernel is harvested and the rest of the plant stays in the field. Dry corn is used in many different ways but its main use is animal feed – especially for chicken and pork. Dry corn is also used in ethanol production, and as a starch and/or sweetener in many soft drinks and other processed foods. Almost any food item in the grocery store contains corn - even some of the more inexpensive ice creams. When a farmer selects a corn variety one of the main criteria he uses is its heat unit ranking (CHU). The higher the ranking the longer it takes for the corn to reach maturity and to be ready for harvest. The variety chosen can also lead to higher yields. If a farmer chooses a variety that reaches maturity more quickly, its yield will almost always be lower. If the farmer chooses a variety that matures later, the yield will almost always be higher but then there is the risk of frost. Frost will kill the plant before it reaches maturity. This leads to lower bushel weight because the kernel is not totally filled.